Whisky distilling in Speyside is more than just an industry, it’s a community – a characteristic that the inaugural Spirit of Speyside: Distilled captured perfectly. Becky Paskin reports. ‘Do not place any items on the pianos,’ a sign warns in big, black capital letters in the backstage area of Elgin Town Hall. While it’s a stern, laminated directive not to mess about with the musical equipment (woe betide you if you dare move said pianos), it’s also a reminder that this venue belongs to the community, to am-dram societies and fundraisers, public consultations and concerts. It may be wildly divergent from the elegant churches and striking Victorian buildings hosting some of the UK’s other whisky festivals, but Elgin Town Hall couldn’t be a more perfect venue for Distilled, the inaugural spin-off of the popular annual Spirit of Speyside festival. If there were an award for the whisky show with the greatest community spirit, Distilled would be a strong contender. Remarkably, Distilled (9-11 September 2016) represented the first exhibition of the region’s distilleries under one roof, although it also brought together many of Speyside’s diverse food and drink producers as well, from rum, gin and beer to shortbread, ice cream and pickles. 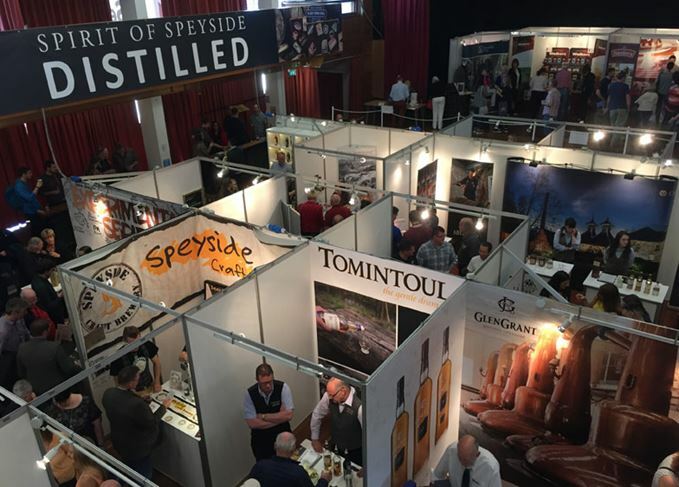 Festival manager Pery Zakeri had hoped to attract a ‘new, younger audience’ with the broader appeal of Distilled, reaching out to consumers not wholly enticed by the prospect of four hours of whisky tasting. ‘Whisky is of major importance in Speyside, but I think this festival has helped show that it is very well complemented by the gin, beer and food producers who joined us in showcasing Speyside’s local larder,’ she said. There may well have been a strong showing of youthful faces in the crowds attending the show’s four sessions, but Distilled’s appeal reached further than its organisers perhaps anticipated (although, disappointingly, no-one claimed to be named after a distillery for free entry). Visitors included a refreshingly equal blend of men and women in the form of couples, friends and even groups dressed up in their glad rags for a big night out. Local residents from Elgin and surrounding towns mingled with tourists who just happened to be in Speyside at the weekend, and serious overseas whisky enthusiasts from Germany, the US, Norway and Sweden, who had flown in especially for the festival. Even Speyside’s whisky distillers, tour guides and visitor centre managers ventured out to enjoy the show. While cocktails (courtesy of Neil Slessor and team from The Station Hotel in Rothes), gin and liqueurs may have appealed to beginners – El:Gin was the best-selling bottle of the day at Whisky Shop Dufftown’s pop-up shop – Distilled’s whisky offering was by no means restricted to entry-level drams. Highlights included a Strathisla 17-year-old, bottled as part of Chivas Brothers’ Distiller Reserve Collection (previously Cask Strength Editions), Glenfarclas Family Cask 1991, exclusive to the Whisky Shop Dufftown, and Macallan Rare Cask, an expression the distillery has rarely showcased at local events. Glenfiddich and Speyside Craft Brewery (SCB) drew a steady crowd around their neighbouring stands as visitors clambered to taste the duo’s new IPA cask-finished malt collaboration. The beer used to season Glenfiddich’s casks was also on tap, providing an opportunity to taste the two side-by-side. Perhaps it was the product’s unique positioning, or SCB’s Seb Jones circling the floor as a human billboard, but the IPA proved so popular it had run out by Saturday evening. Community being the buzzword of Distilled, collaborations between producers were rife at the show. Dufftown’s Balvenie Street had partnered with Spey Valley Brewery to produce a stout-flavoured ice cream which, scooped into a glass of the same beer, produced a creamy, indulgent, alcoholic ice cream float (for the record, you can’t just chuck any old ice cream into a beer and expect it to work. Trust me, I tried and failed). David MacDonald, founder of Spey Valley Brewery, was also eager to recommend hauf and hauf pairings to visitors using drams that could be found around the show, such as matching his Bigger and Bitterer with Cardhu 18-year-old. For those seeking to learn more about whisky, Distilled offered a variety of masterclasses hosted by some of the biggest names in the industry. Andy Cant, master distiller at Cardhu, lead a roomful of enthusiasts through some of his favourite rare bottlings, including a 34-year-old Dailuaine from Diageo’s Special Releases; whisky writer Martine Nouet delighted visitors with her lovingly prepared puddings and whisky pairings; and Dennis Malcolm, master distiller at Glen Grant, guided attendees through some of the Rothes distillery’s new expressions. In true Distilled fashion, the classes weren’t all about whisky though – Nigel Tiddy of Windswept Brewing Company demonstrated the influence of yeast strain and fermentation temperature on beer flavour profiles in a fascinating session, while Gordon Castle delivered a mini mixology masterclass using its botanical gins and liqueurs. Speyside’s whisky community extends beyond the distilleries and global whisky enthusiasts; it encompasses all manner of regional business and local residents too, all of which benefit from whisky’s economic contribution and tourism halo effect. We talk of traditional regional whisky characteristics being outdated and irrelevant, but what makes a Scotch region identifiable and unique from any other is its people – its community – something that Spirit of Speyside Distilled has captured perfectly. Speyside’s new Distilled festival is offering free tickets to anyone named after a distillery. The joys of organising Scotland’s largest whisky event – and why it feels like one big family. Does Scotch single malt’s absence from a leading bar show speak volumes about cocktail snobbery? Carlsberg probably isn’t the world’s best, says Dave Broom, but can anything really be?